The following diagram shows the architecture of RhodeCode applications. RhodeCode Control installs, upgrades and configures RhodeCode Enterprise and the VCS Server. Supervisor allows monitoring and process control of installed instances. RhodeCode Enterprise is the main application for managing your code, workflow and users. VCS Server is the backend for actions on your code repositories. 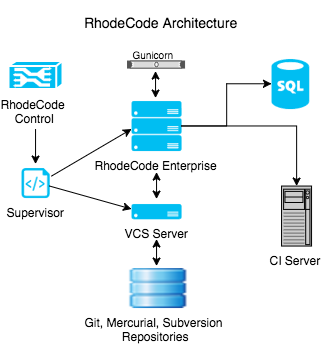 SQL refers to your production database supporting RhodeCode Enterprise. CI Servers refers to Jenkins, or other services used for tests or builds. RhodeCode Control is intended to be the main method of managing RhodeCode instances. As such direct calls to supervisor are neither encouraged or officially supported.